The World War II-themed strip also has some historical significance, in that the date of its appearing in print is less than a month after Pearl Harbor and the start of World War II. 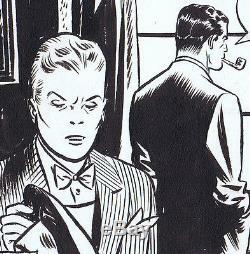 The artwork is signed by Caniff in the fourth panel. He has written the number "1" in the upper left corner, to show this is the first daily of the week, followed by "Terry" (the abbreviated title). Above the fourth panel, he titled this particular strip "Maid, Afraid, Fades", a reference to character, April Kane, being a damsel in distress, as pictured in the fourth panel. 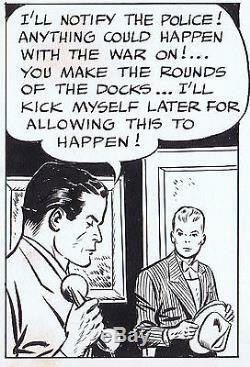 The first three panels feature title character, Terry Lee and the other main character, Pat Ryan, in attractive head and shoulder close-ups. The fourth panel shows a firghtened April Kane huddling underground with several Chinese friends. This particular artwork displays some of Caniff's impressionistic chiaroscuro brushwork, for which he is famous! For a 74 year old comic strip, this is in excellent overall condition. The art board is triple-ply Strathmore (the embossed emblem is visible in the upper right corner). The entire art board is 22 7/8" wide and 6 5/16" high, with the image area measuring 19 11/16" wide x 5 3/8" high. The corners show some wear and the edges were cut slightly unevenly by the artist. The art board is off-white with some minor staining, mostly visible in the margins away from the artwork. There are some some pencil smudges and fingerprints, most of which could be removed by erasing, if you wish (I prefer to leave the signs of the artist's handiwork visible). The India ink is still a rich black. There is no white ink or paste-overs used for corrections. 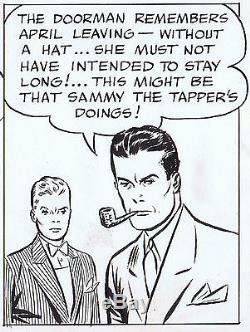 There is some minor evidence of a razor blade being used to touch up a couple word balloons and possibly below Pat Ryan's pipe in panel two. There are a couple penciled editor's notes in the left and right margins. Please note that the artwork is too large to fit entirely on a scanner, so I have provided multiple scans of the artwork to show every bit of the art board. The artwork is all in one piece, with no bends or folds. 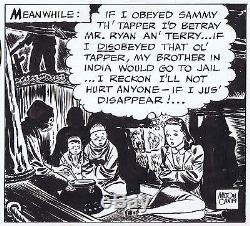 Milton Caniff is one of the very most popular and highly regarded comic artists of all time and his work is rare and highly desirable to collectors, especially his work on Terry & the Pirates that feature his signature chiaroscuro technique, like this one. This piece has been in my collection for over ten years. 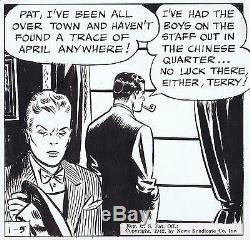 The item "MILTON CANIFF Beautiful TERRY & PIRATES Original hand-drawn one-of-a-kind 1-5-42" is in sale since Tuesday, November 15, 2016. This item is in the category "Collectibles\Comics\Original Comic Art\Comic Strip Art".